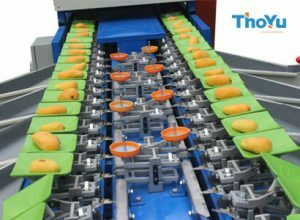 Automatic tomato weight grading machine is suitable for grading fruits and vegetables by weight. Despite technically being a fruit, the tomato is generally categorized as a vegetable. Tomatoes are the major dietary source of the antioxidant lycopene, which has been linked to many health benefits, including reduced risk of heart disease and cancer. They are also a great source of vitamin C, potassium, folate and vitamin K.
A study in middle-aged men showed that low blood levels of lycopene and beta-carotene are linked to increased risk of heart attacks and strokes. Increasing evidence from clinical trials shows that lycopene supplementation is effective at lowering LDL cholesterol. Clinical trials of tomato products have also shown benefit against inflammation and markers of oxidative stress. They also show a protective effect on the inner layer of our blood vessels and may decrease the risk of blood clotting. Observational studies have found links between tomatoes, tomato products, and fewer incidences of prostate-, lung- and stomach cancers. The high lycopene content is believed to be the main reason for these protective effects, but high quality human trials are needed to confirm this. A study in women shows that high concentrations of carotenoids, found in high amounts in tomatoes, may protect against the development of breast cancer. Tomatoes are considered beneficial for skin health. Tomato-based foods rich in lycopene and other plant compounds may protect against sunburn. According to one study, there were 40% fewer sunburns after ingesting 40 grams of tomato paste (providing 16 mg of lycopene) with olive oil, every day for 10 weeks. 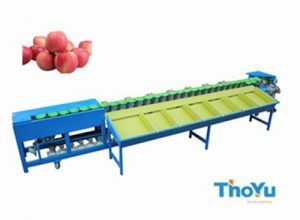 Automatic tomato weight grading machine adopts balance and lever principle. 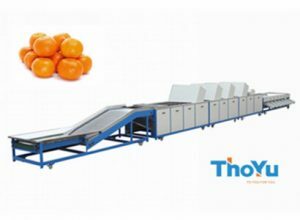 ThoYu adopts the balance and lever principle to weight every tomato. So the accuracy is very high. Meantime, the accuracy of automatic tomato weight sorting machine is up to 99%. Tomatoes have a very sensitive pulp and therefore are fragile. Hence, the only way to preserve them is by using a technology that gives priority to gentle handing. Besides, this is exactly what ThoYu does, with great softness it preserves the integrity of tomatoes. 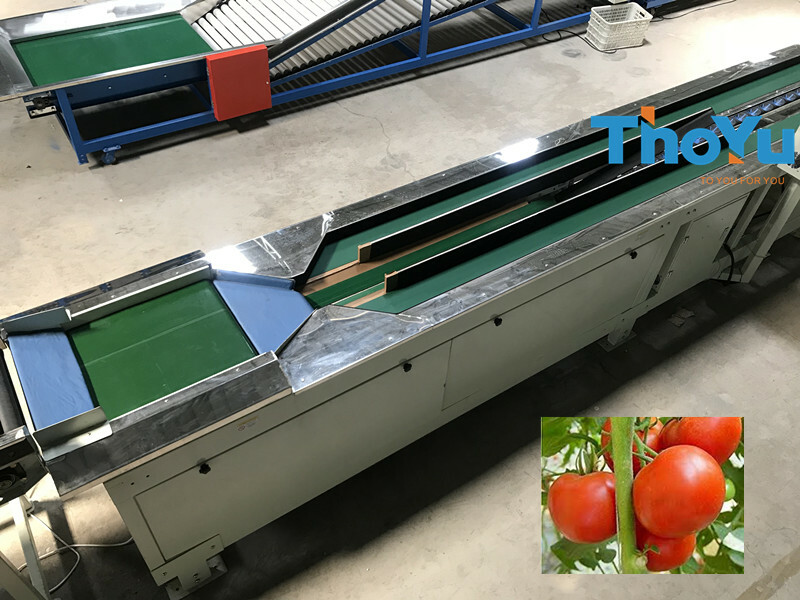 Automatic tomato weight sorting machine adopts a lot of working benches. Hence, the capacity is 2 tons per hour and there are 12 grades. Besides we also can customize the capacity for your special needs. 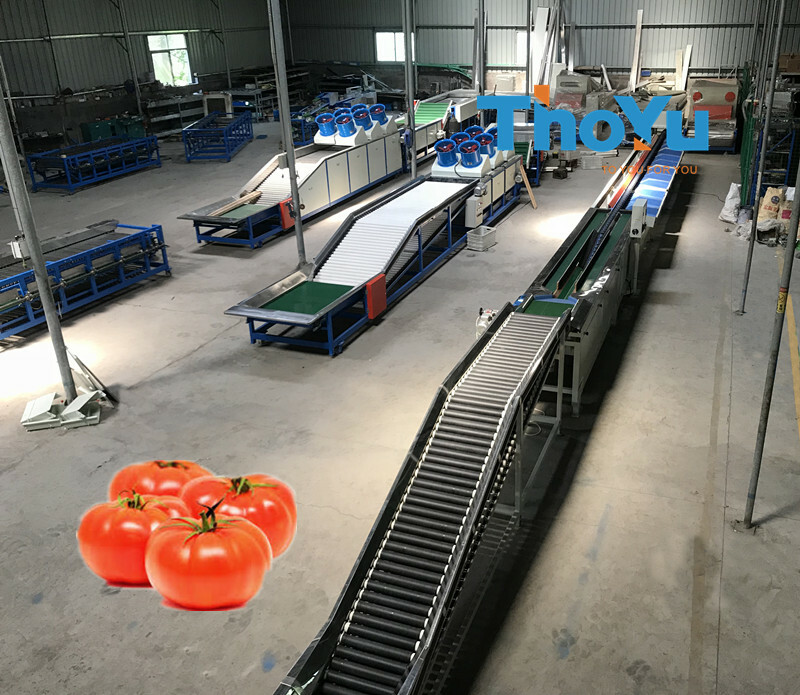 All the materials of tomato sorting machine are food-grade. Therefore, they can not damage the tomato. 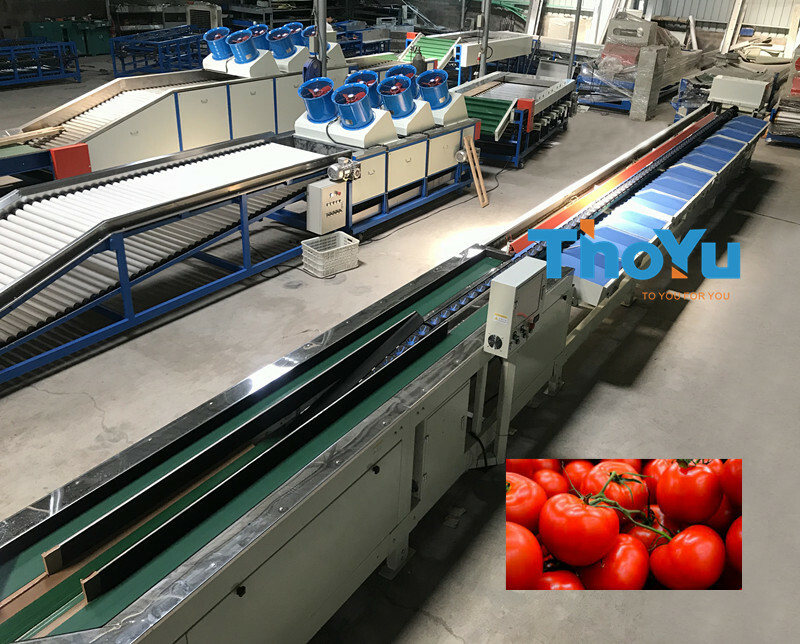 Tomato grader adopts automatic feeding, and no manual placement, so that you can save labor cost. 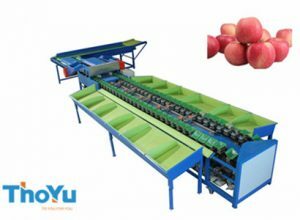 Tomato grading machine is appropriate for all kinds of fruits and vegetables, such as tomato, pear, dragon fruit, pomegranate, mango, peach, kiwi, pineapple, persimmon, and so on.